VATICAN CITY (CNS) — A massive, detailed Vatican-ordered investigation of U.S. communities of women religious ended with a call to the women themselves to continue discerning how best to live the Gospel in fidelity to their orders’ founding ideals while facing steeply declining numbers and a rapidly aging membership. Although initially seen by many religious and lay Catholics as a punitive measure, the apostolic visitation concluded with the publication Dec. 16 of a 5,000-word final report summarizing the problems and challenges the women themselves see in their communities and thanking them for their service to the church and to society, especially the poor. The visitation process, carried out between 2009 and 2012 with detailed questionnaires and on-site visits, mainly by other women religious, “sought to convey the caring support of the church in respectful, sister-to-sister dialogue,” says the final report by the Congregation for Institutes of Consecrated Life and Societies of Apostolic Life. 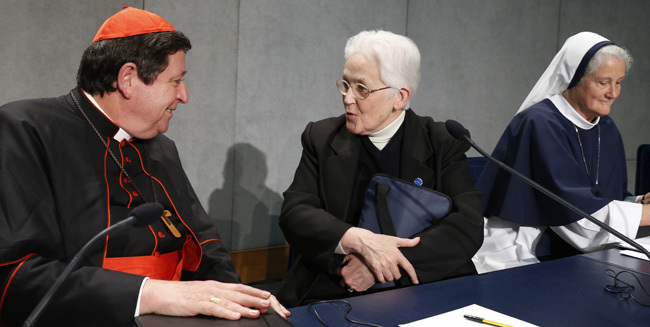 The process attempted to help the Vatican “and the sisters themselves to be more cognizant of their current situation and challenges in order to formulate realistic, effective plans for the future,” said the report, signed by Cardinal Joao Braz de Aviz, prefect of the congregation for religious, and Archbishop Jose Rodriguez Carballo, secretary. In summarizing the results, the congregation called for special attention in several areas, including: formation programs for new members; the personal, liturgical and common prayer life of members; ensuring their spiritual practices and ministries are fully in harmony with church teaching “about God, creation, the Incarnation and redemption” in Christ; strengthening community life, especially for members living on their own or with just one other sister; living their vow of poverty while wisely administering financial resources; and strengthening communion within the church, especially with the bishops and Vatican officials. The former prefect of the congregation, Cardinal Franc Rode, ordered the visitation in 2008, saying its aim would be to study the community, prayer and apostolic life of the orders to learn why the number of religious women in the United States had declined so sharply since the 1960s. As the process began, the Leadership Conference of Women Religious, which represents about 80 percent of U.S. women religious, questioned what its officials considered a lack of full disclosure about what motivated the visitation. At a news conference presenting the report Dec. 16, the Congregation for Institutes of Consecrated Life and Societies of Apostolic Life invited both the president of the LCWR and the chairwoman of the smaller U.S. Council of Major Superiors of Women Religious to address the media. They were joined by Mother Mary Clare Millea, superior general of the Apostles of the Sacred Heart of Jesus and the apostolic visitor appointed by the Vatican. The congregation’s final report says that while apostolic visits are “a normal instrument of governance” designed to “assist the group in question to improve the way in which it carries out its mission in the life of the church,” the visitation of U.S. women religious “was unprecedented” in many ways. “It involved 341 religious institutes of both diocesan and pontifical right, to which approximately 50,000 women religious throughout the United States belong,” the report says. Only communities of cloistered nuns were excluded. Citing a wide variety of founding principles, ministries and community sizes, the congregation’s final report notes an overall trend of “aging and diminishment” in the number of members. The congregation’s report does not make specific recommendations other than urging the entire church “to offer fervent prayer for religious vocations” and to ask religious communities to ensure they provide “a solid, theological, human, cultural, spiritual and pastoral preparation” for religious life.